Valentine’s Day is THE busiest day of our year, with many lovers in Rockingham sending romantic gifts like roses, roses and lilies, candles chocolates and balloons. We are busy preparing for this big day, as well as getting ready for our move to 10A Ameer St, Rockingham. Red roses are the most popular flower choice for Valentine’s Day delivery, however we will have many other flower and gift choices available at our Rockingham flower shop. We have launched our new range of gourmet gift hampers – just in time for Christmas. The new range includes Hot Stuff – a selection of gourmet chilli sauces and relishes, Sweet Tooth – biscuits, dessert sauces and rock candy and Nom Noms – something for everybody. Did you know we deliver on Christmas Eve? Just like Santa! Hanging Basket Florist have a new online service to help clients remember those special occasions when flowers are an ideal gift. Have trouble remembering your wife’s birthday? Just complete this online form and we will send you an email 3 days before a birthday, anniversary or other special occasion. Never Forget Their Birthday Again! We have a great solution for FIFO workers and others who spend a long time away from their loved ones – a flower subscription service. 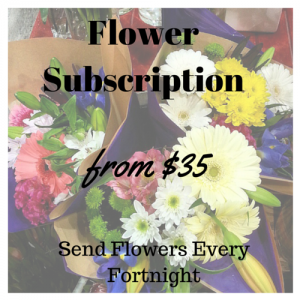 On our website right now you can order a bunch for flowers to be delivered in Rockingham every fortnight from just $35. With our flower subscription you will never need to be reminded to send flowers again. Treat yourself with a bunch of fresh flowers sent on your day of choice (Mon – Sat) to your home or work. Cheer up your workplace or add an element of luxury to your home decor. Our flowers are sourced from the best local growers and trusted importers so you can be sure that your bunch will be of the highest quality. We will send something a little different each fortnight – from specimen bunches of one type of flower to a hand-picked selection of mixed blooms. 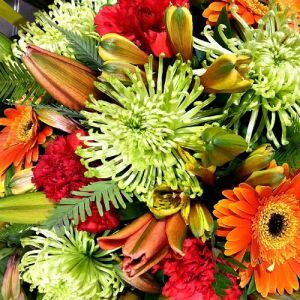 To get the best value and service, be sure to choose a real local florist like Hanging Basket Florist in Rockingham WA. With e-commerce now an everyday reality there are many different companies competing for your attention online. Unfortunately there are some companies out there who are using deceptive means to get your money. Typically when you search for Rockingham Florist on Google, the top three result are ads. More often than not these ads are paid for by companies with big marketing budgets and not your local florist. These companies have created business names to seem like they are a real florist, using common womens names with the word florist (eg Sally’s Florist) to try to deceive the customer into believing they are dealing with a real local florist. However the reality is that they are an Eastern States based business with a call centre and websites, and not a stem of flowers to be seen. These companies then send on your order on to the real local florist, minus a commission. When a customer buys flowers in this way, the profits go to a large corporation over East, taking the money out of the local area. As a real local business, we employ local Rockingham people and spend our money in the Rockingham area. Some people like to be ethical consumers who want to support their local community, others couldn’t care less, but in any case more often than not you will get a better deal by going direct to your local florist. In addition to better prices the local florist can offer helpful advice and make suggestions on what flowers are best at the moment and offer custom-designed arrangements and bouquets. The customer is not limited to ordering from pictures on the internet. Given the lengths that these middlemen – or order gatherers as they are known in the floral industry – go to to give the impression that they are real flower shops, how is a customer to know the difference? Have a local address. If there is no address on the website or if you see the business listing on Google Maps and it is a house or the middle of a park, chances are it is a bogus listing. Have a local phone number. Small businesses with only one outlet do not have 1300 phone numbers. Support the businesses that support your community and buy local. Hanging Basket Florist in Rockingham has launched a special selection of romantic floral designs that will make sure your Valentine’s Day goes exactly as planned. Everybody loves to receive a special delivery of flowers around Valentine’s Day, which is why our flower shop, which can be found at Rockingham Shopping Centre, has created a stunning selection of hand-crafted gifts. Items range from timeless classics such as a dozen red roses or a single red rose in a gift box, through to more contemporary designs containing alternatives to roses such as Oriental Lilliums, Orchids or Gerberas. What’s more, as fully trained professional florists, they’ll even make up a bespoke design exactly to your requirements, should you have something special in mind. Take the bouquet below for example – the contrasting purple really makes the red roses pop! Plants haven’t been forgotten either, with a large choice of romantic offerings all beautifully packaged. Champagne, cuddly toys, chocolates and balloons are available too, helping you to make this Valentine’s Day one to remember. 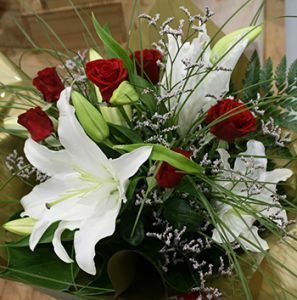 All of Hanging Basket Florist Valentine’s flowers are hand crafted by skilled florists using the freshest flowers and are ready for take away from the shop or to be personally delivered on the date of your choice. Even with over 5,000 roses to process, six florists and four delivery drivers to organise we still love Valentine’s Day – nothing beats the look on the recipient’s face when they receive their flowers and they’ll love you for it too – simply give us a call and let us make sure Valentine’s Day 2015 is a truly memorable one for you. 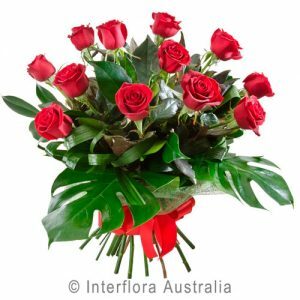 What’s more, Hanging Basket Florist can also arrange for you to send flowers to loved ones who you can’t be with on Valentine’s Day, wherever they are in Australia, the UK or further afield, via the Direct2florist or Interflora networks of professional florists. To find out more about Hanging Basket Florists Valentine’s gifts, call (08) 9527 5562 or visit ww.hangingbasketflorist.com/valentinesday. We will now be open every Sunday from 11 AM to 4 PM. Hanging Basket Florist is the only flower shop in the Rockingham and Kwinana area to be open on Sundays. While you are getting your Christmas shopping done on Sunday take a moment to de-stress – just stop in to smell the beautiful flowers! It can be a lovely, calming experience to take in the visual and fragrant beauty of a flower shop. Hanging Basket Florist is the only flower shop open on Sundays in the Rockingham Kwinana area. From this weekend we will be open from 11 AM – 4 PM on Sundays. This will make us the only florist in the Rockingham – Kwinana area to be open on Sundays. We will have a variety of arrangements, bouquets and mixed bunches available for sale, as well as our usual services. If you find you are too busy during the week you will now be able to place your Interflora and local flower orders for delivery later in the week and we will be available for bridal flower consultations. Find us in Rockingham Shopping Centre this Sunday.